Bar Humbug Bubble Bar | £3.65 // I love the design of this bubble bar and anything liquorice scented I'll buy. The liquorice scent isn't as strong as I'd hoped it would be and I can smell more of the bergamot with a hint of citrus. This does create an amazing amount of bubbles though and turns the water a lovely purple colour with a lot of silver lustre. Snow Fairy Shower Gel | £3.95 - £21.50 // I always pick up a bottle or two of Snow Fairy when it's released and although it's incredibly sickly sweet, there's just something about it that I love. I am secretly glad it's only available around Christmas as I honestly would be sick of it by now if I used it all year round. It doesn't feel like Christmas though if I haven't got a bottle in my bathroom! I love pairing this with the Magic Wand Reusable Bubble Bar as they share the same scent. 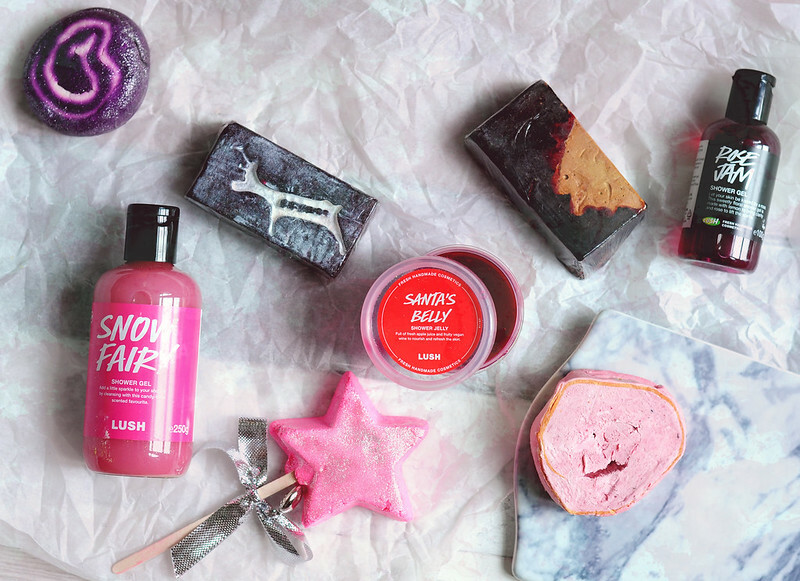 Reindeer Rock Soap | £3.25 // I feel like there are a lot of favourites in this round up post and this is one of them. The scent reminds me of The Comforter, another all-time favourite, so I knew I had to buy a slice. It's a mix of lingonberry, cassis, cypress oil and bergamot. I also love the design! Santas Belly Shower Jelly | £3.95 // This has a similar scent to So White Bath Bomb and since they haven't released the shower gel again this year I knew I had to buy Santas Belly to tide me over. I intend to use this to make bubbles as well as using it instead of a shower gel so I'll report back with how effective it is. I love the apple scent and it's a scent you don't come across too much when it comes to bath and body products. Magic Wand Reusable Bubble Bar | £5.25 // As I've already mentioned, this has the same scent as Snow Fairy Shower Gel and I don't think I've bought this when it's been released in previous years. Why I have no idea but at least I have it now. I really like the reusable bubble bars as I find they last a lot longer than the traditional ones you crumble into the water. Instead you run this under the hot tap until your bath is filled with bubbles and then you leave it on the side to dry out before the next use. Old Father Time Soap | £3.50 // This is a new addition to this years Christmas line up and is packed full of shimmer. The full soap is really impressive to look at although the slice I got is a bit boring but I guess it's the scent and how it works that's important. It has quite a subtle herbal scent so a good one if you don't like the sweet or floral products. I can smell the sage and thyme the strongest but there's a hint of berry to it. The Icing On The Cake Roulade | £5 // This has a similar scent to Ponche Shower Gel which I had a bottle of last year (or even the year before!). It's a mix of almond milk, chestnut puree, orange, lime and lemon. The roulades are packed full of cocoa butter and other others to keep your skin hydrated. I'm not too sure how I feel about the roulades as they have replaced some of my favourite shower smoothies and the few roulades I have tried haven't impressed me too much so we'll see what I think about Icing On The Cake. It looks pretty but we shall see if it's as good as people say it is. You use it like you would a soap or shower gel and I've found the easiest way of using the roulades is to break a small amount off and lather it in your hands as you usually would with a soap. Rose Jam Shower Gel | £4.95 - £27.95 // This is actually a mini bottle I had left over from last year that I was saving but it still smells just as good as the day I bought it. The smell reminds me of turkish delight and is a lovely rose scent. There is nothing old ladyish about this one! I'm hoping to pick up a larger bottle in the boxing day sales.